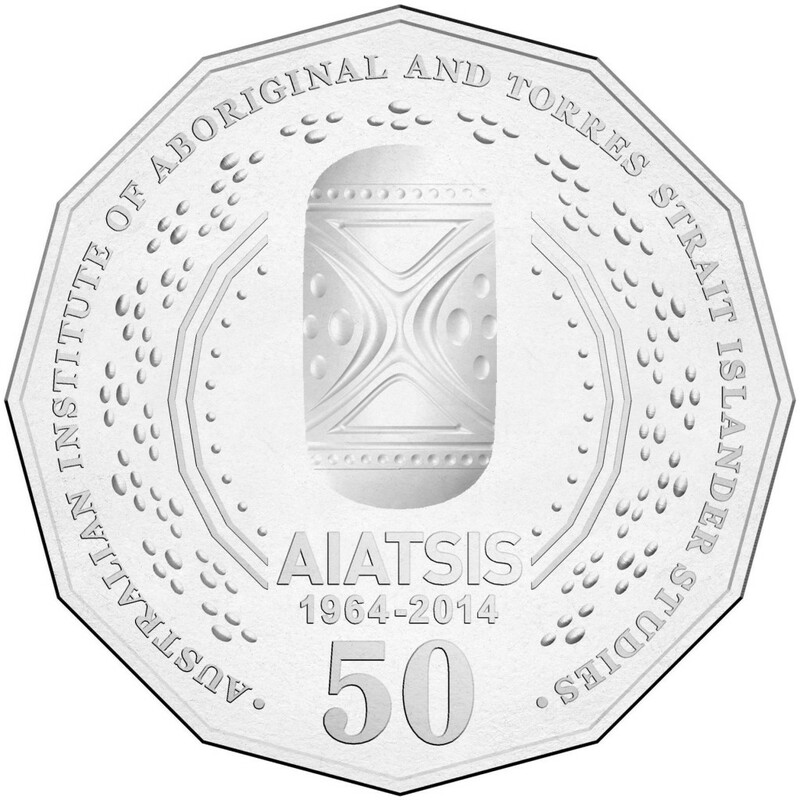 You will soon find a new circulation 50 cent in your change with the Royal Australian Mint this week releasing 2 million of the AIATSIS 50c coin celebrating 50 years of the institute dedicated to recognising and appreciating the values and culture of our indigenous people. The coin was officially launched last week at an event at Parliament House in Canberra attended by the Prime Minister in time for NAIDOC week July 6-13 2014. The coin seen above is for circulation and a coloured version has been minted for the collector market. The reverse of the coin features part of the AIATSIS logo, a representation of a shield derived from the painted boomerang totem (fighting shield) of the Gu:na:ni (Kunjen) people from the Mitchell River region of the Gulf of Carpentaria and a piece in the AIATSIS collection of indigenous treasures the institute cares for. The design bears 2 boomerangs with circles, lines and dots. The portrait of Queen Elizabeth II is depicted on the obverse by Ian Rank-Broadley. AIATSIS, the Australian Institute of Aboriginal and Torres Strait Islander Studies is an internationally recognised institute celebrating it’s 50th year. Having such a coin in circulation hopes to remind those as they receive one in change of the culture and contributions of Aboriginals and Torres Strait Islanders to the country and Australian society. 2 million is a very small number of coins issued for circulation and finding one in change or from the bank is the only way to obtain one of these non-coloured circulation fifty cent coins.